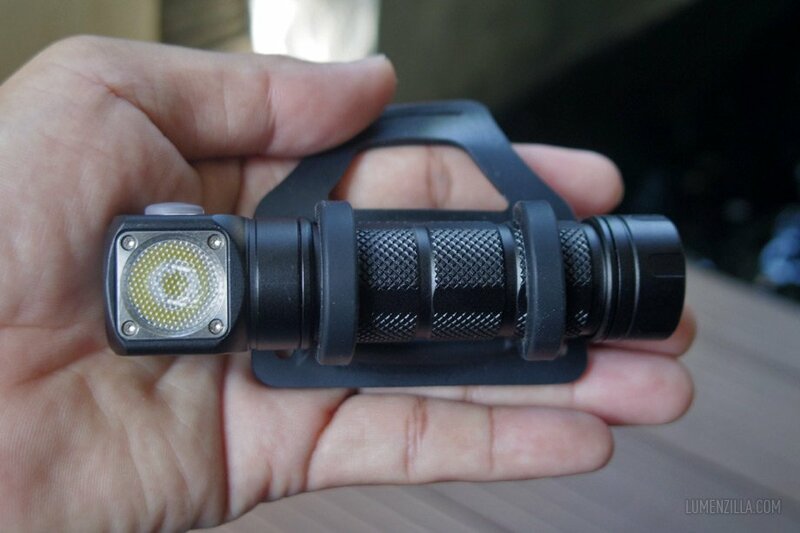 Earlier this month, I received a Skilhunt H03 from Gearbest. 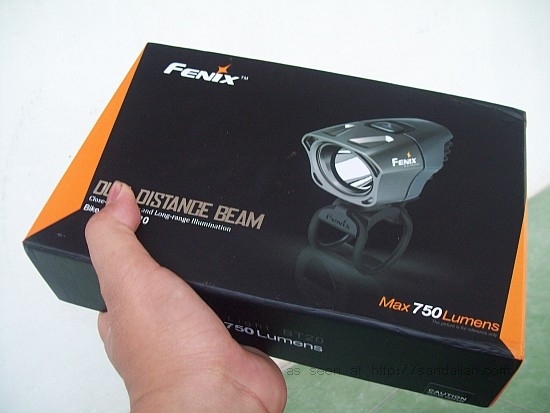 It’s a 1200 lumens headlamp powered by a 18650 battery or two 16340 batteries. 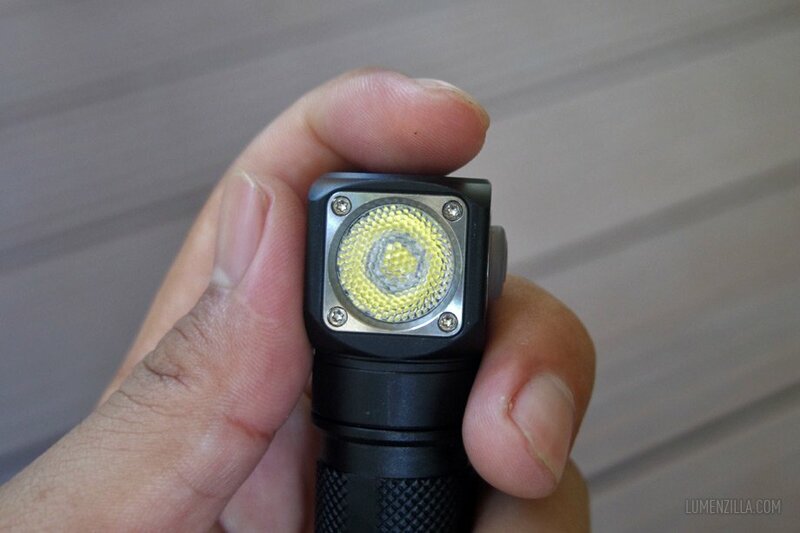 It can be used independently as flashlight by detaching it from the headband. All models are available in both cool and neutral white. 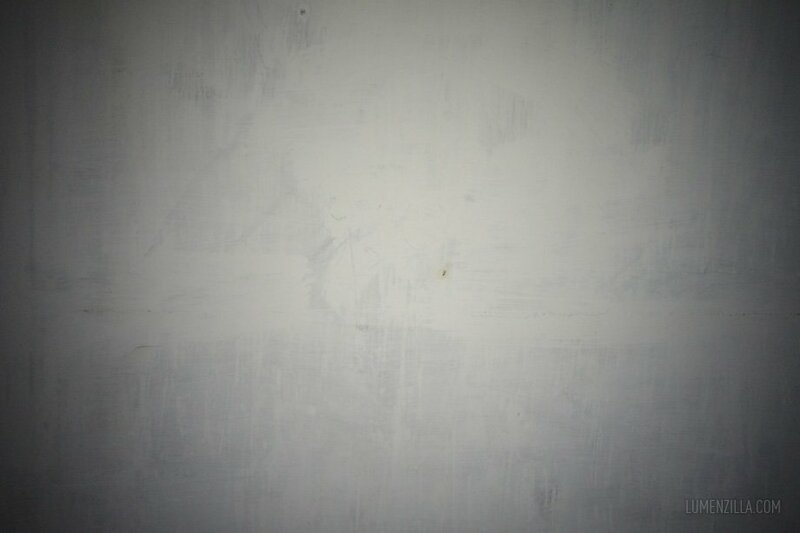 The model I receive is neutral white and it’s pretty impressive. Here’s what I got, packed in a nice looking (and strong) yellow cardboard. 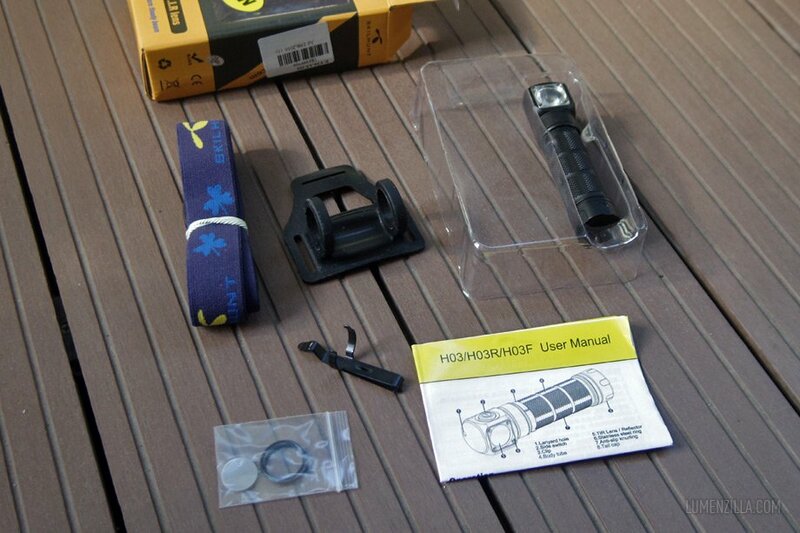 The shape of the headlamp itself is nice. 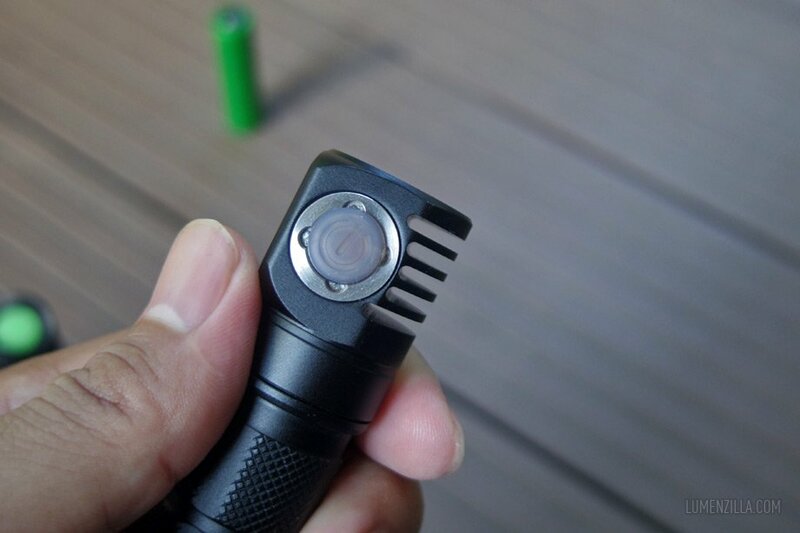 The metal bezel that keep the TIR optic gives a strong look and secured by four torx screws. 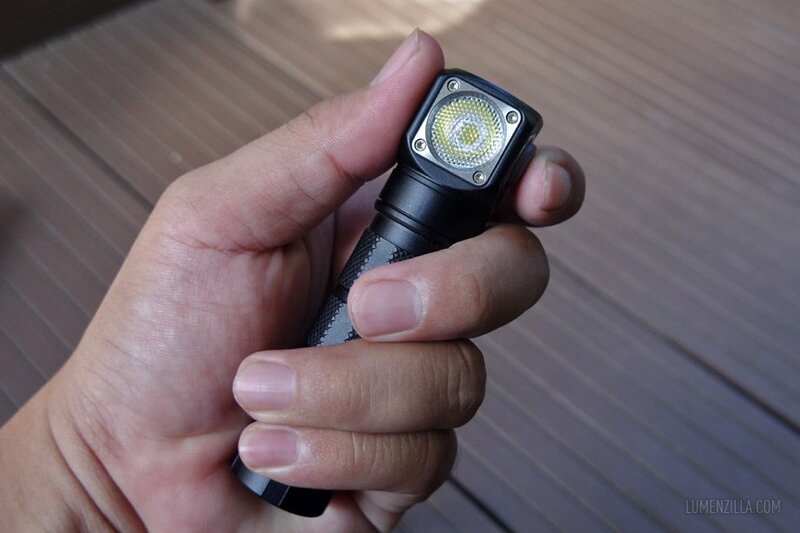 The switch is located at the side of the LED part when I stand the flashlight up. Here’s the switch details, it’s translucent and look strong. 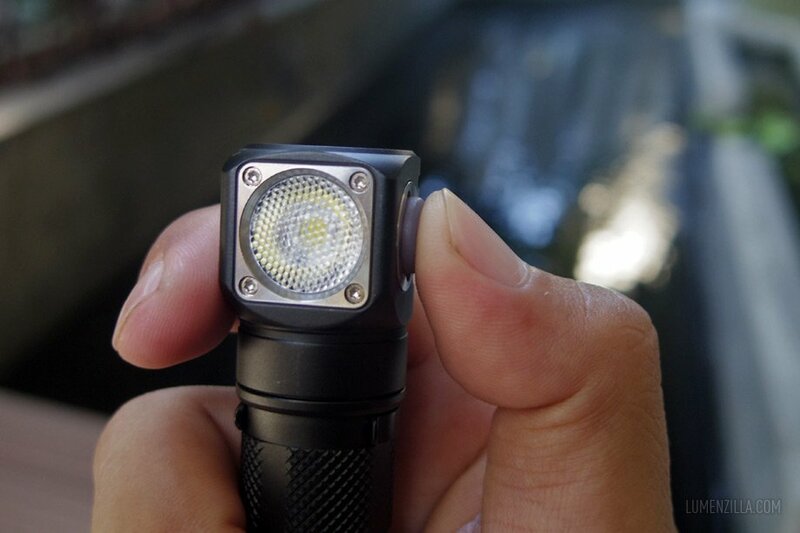 The fins design is also impressive, they’re deep and thin, designed to help heat dissipation during the flashlight usage. 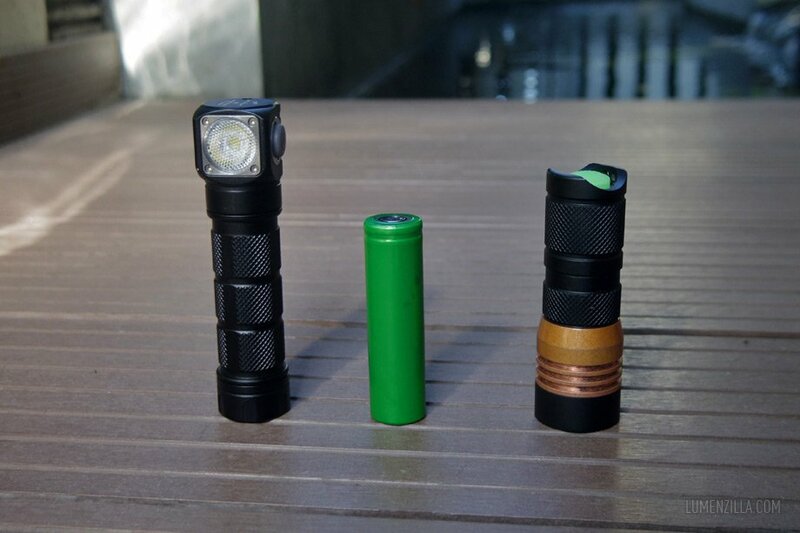 To help you estimate the dimension, here’s Skilhunt H03 posing together with the famous Manker E14 and an unprotected 18650 battery scrapped from an old Sony laptop’s battery. I’m unable to open the head so here’s the best shot I can get for the driver. Behind the spring on tail cap, there’s a strong magnet that will help this headlamp easy to mount to any ferrous metal surfaces. 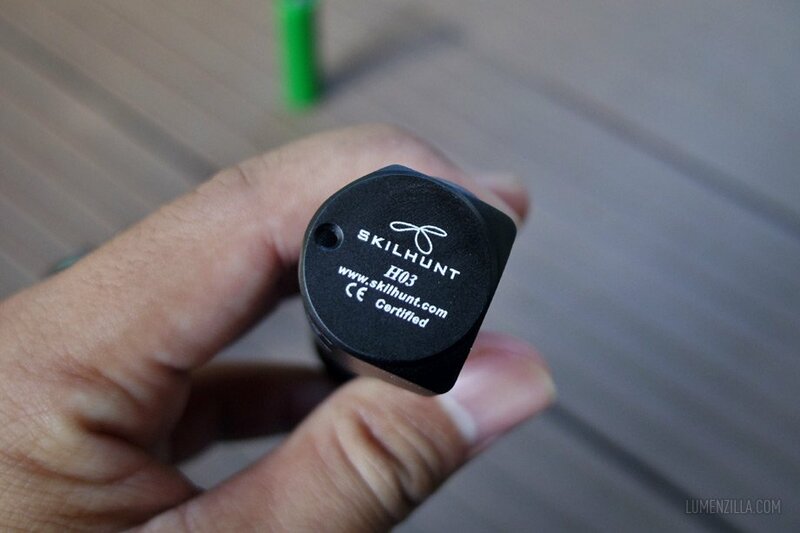 Skilhunt H03’s body is made from what they call aircraft-grade aluminum alloy. 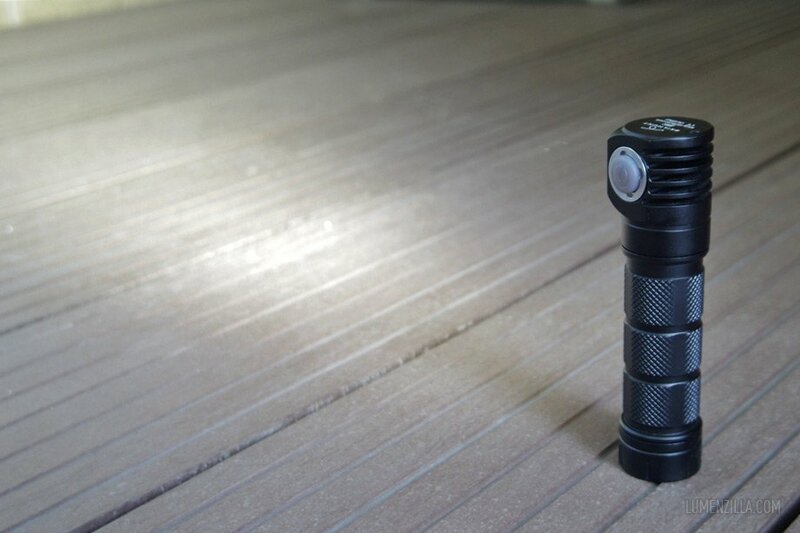 It’s a lot thinner than Manker E14’s body but feel strong. The diamond knurlings on the body is decent and comfortable on my palm. 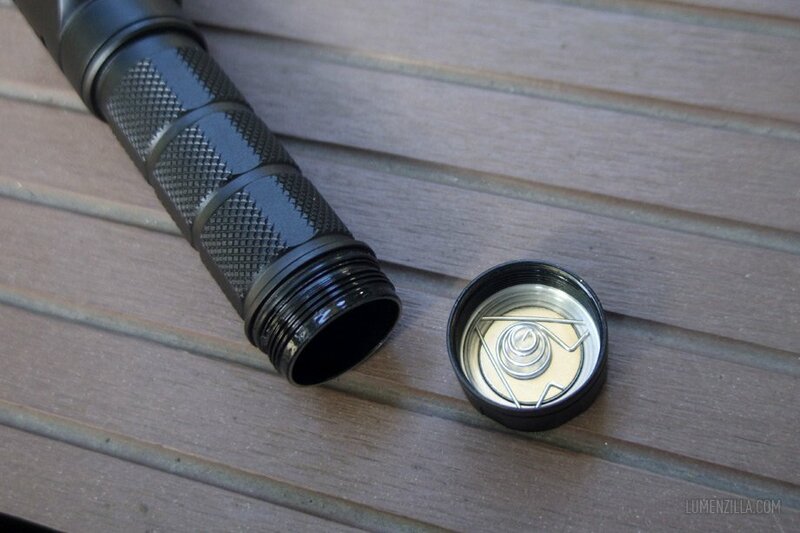 The company’s logo and brand is printed on top of the flashlight and there’s a hole where we can attach a lanyard on it. 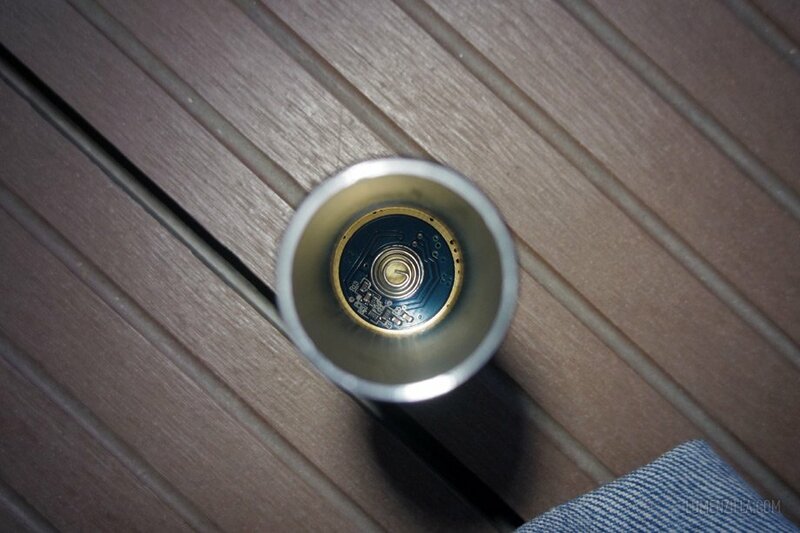 And here’s the highlight, Cree XM-L2 U4 is seen beneath the TIR optic below. With the working voltage from 2.7-8.4 Volts, we can use a single 18650 battery or even two RCR123 batteries. 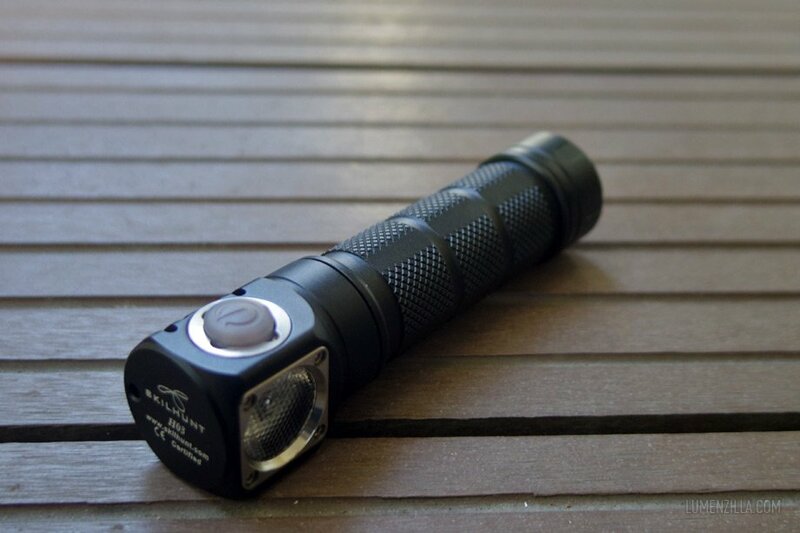 It’s a plus because some other flashlights can only using 2 x primary CR123 (non rechargeable) and unable to accept 2 x RCR123 (16340). 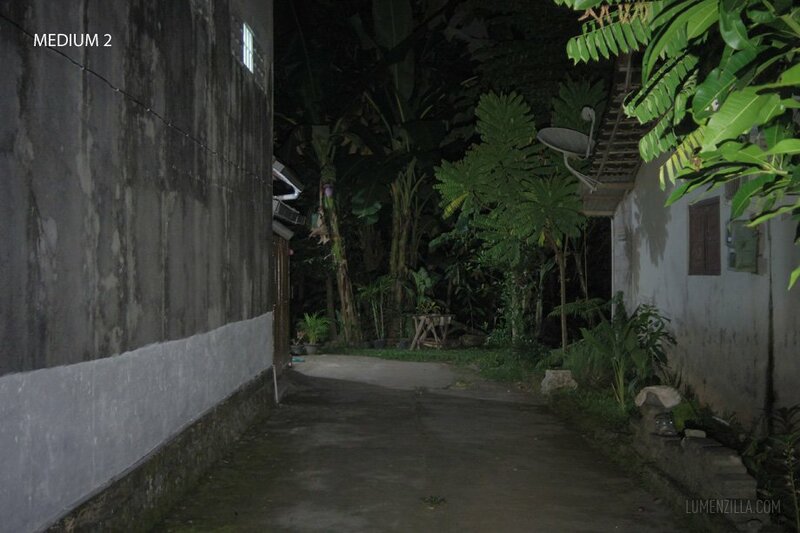 Rated output is maximum 1200 lumens with beam distance up to 100-150 meters. 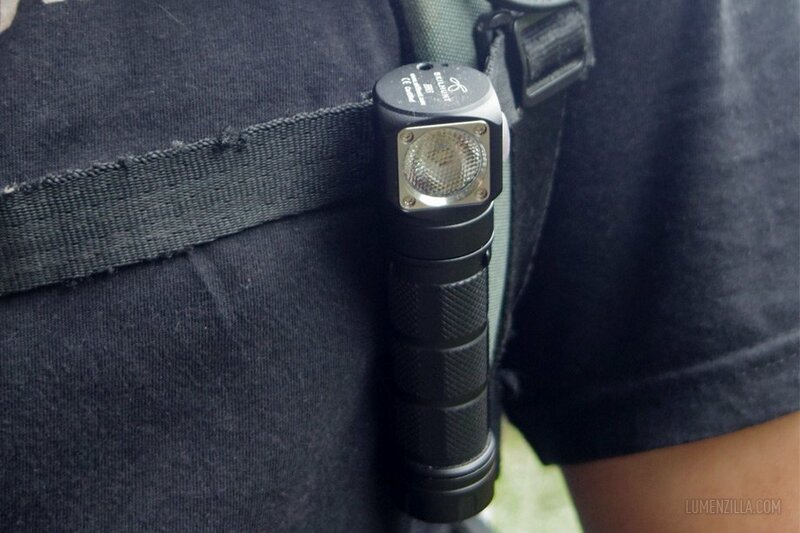 You’re given the choice to use this flashlight as either flashlight or headlamp. 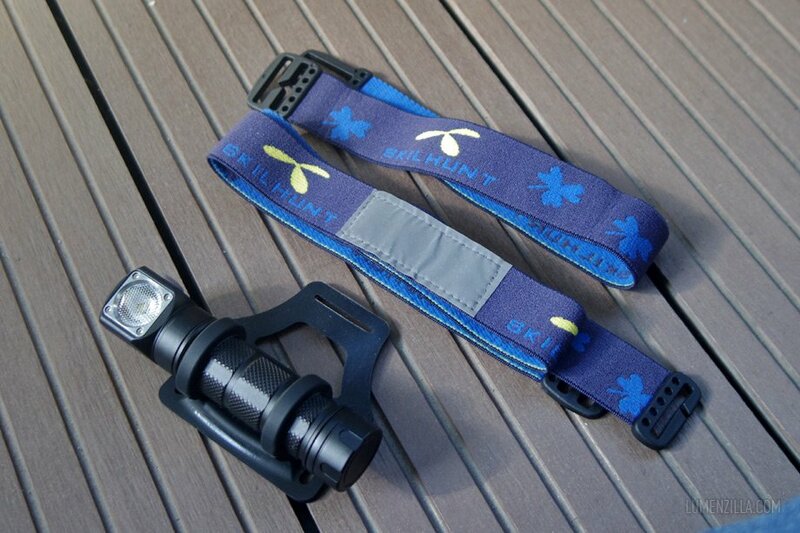 Attach Skilhunt H03 into its headband and it become a headlamp. 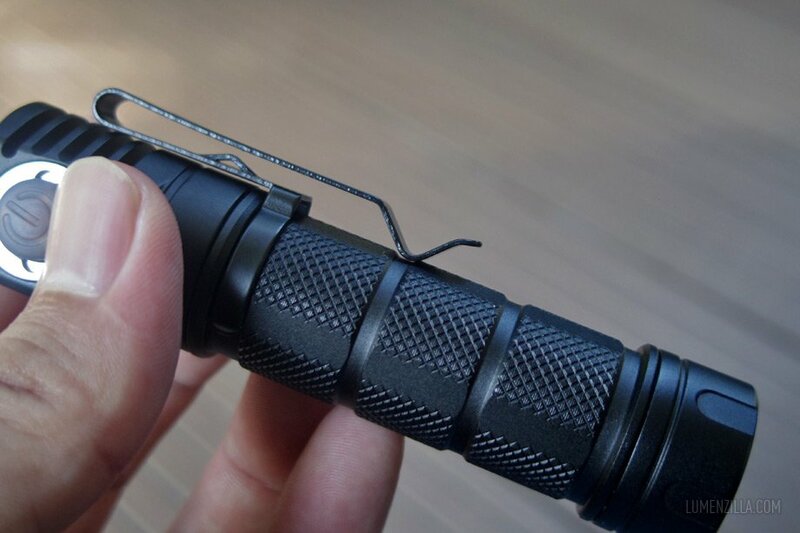 Or detach it from its headband and put a pocket clip on it and voila.. it becomes a flashlight. 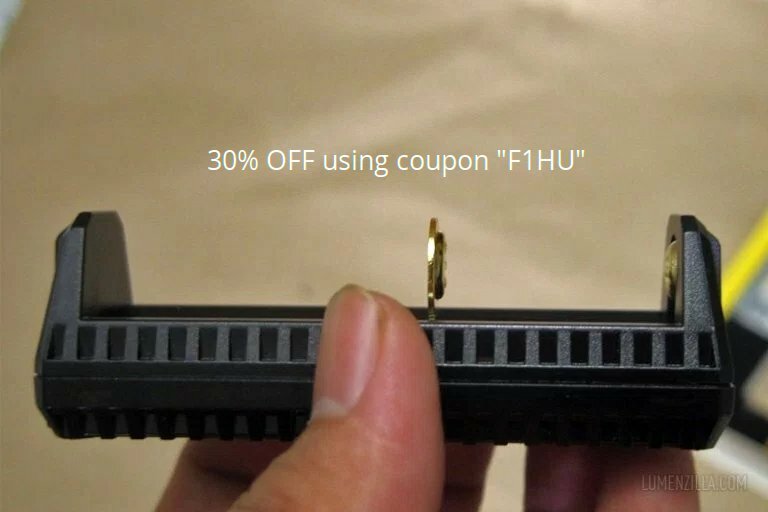 Unfortunately, the clip position can’be reversed because it looks ugly and I doubt it will be functional. 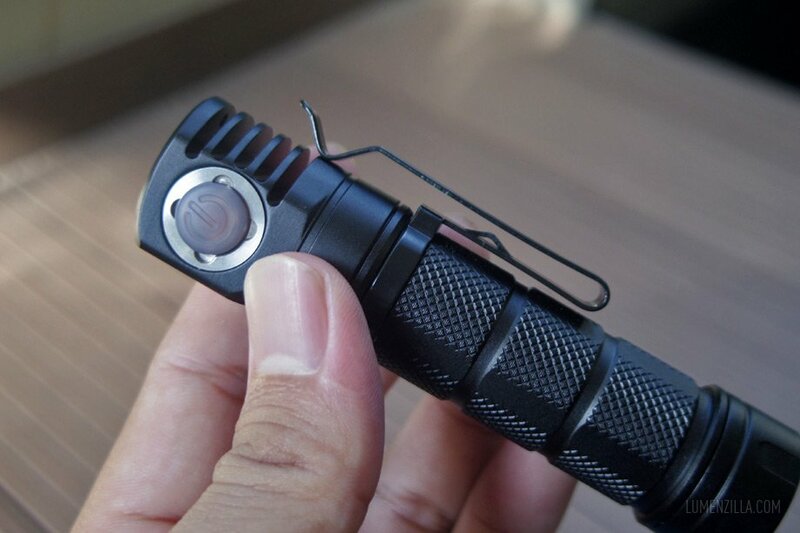 Anyhow, you can also attach the clip on your chest as an angle light just like what I did. 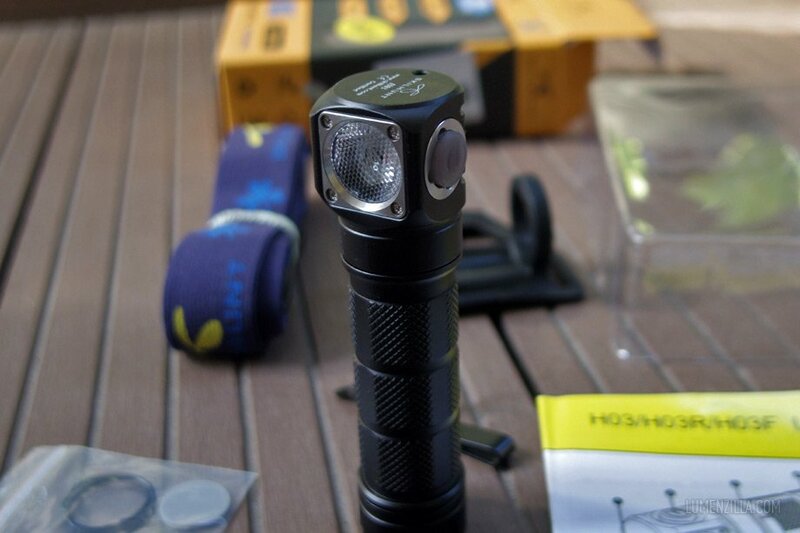 Skilhunt H03 has four main modes and all four main modes have their own submodes which is accessible by double clicking the switch at any mode. Click the switch to turn on the light at the last memorized brightness level. Another click will cycle into its four modes. Long-press the switch to turn off the light. From off, long-press the switch to access low mode. Or, from off, double click the switch to access turbo mode. Or triple click from off mode to access disco mode then double click to switch from three special disco modes. As mentioned before, the TIR optic used on this headlamp resulting a flooding light with no visible hotspot. 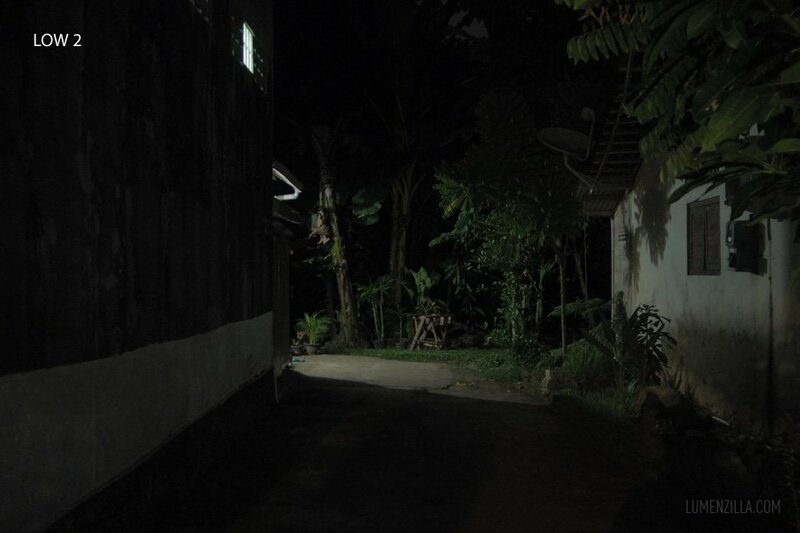 Here’s wall shot taken from 2 meters away, nice flooding light! 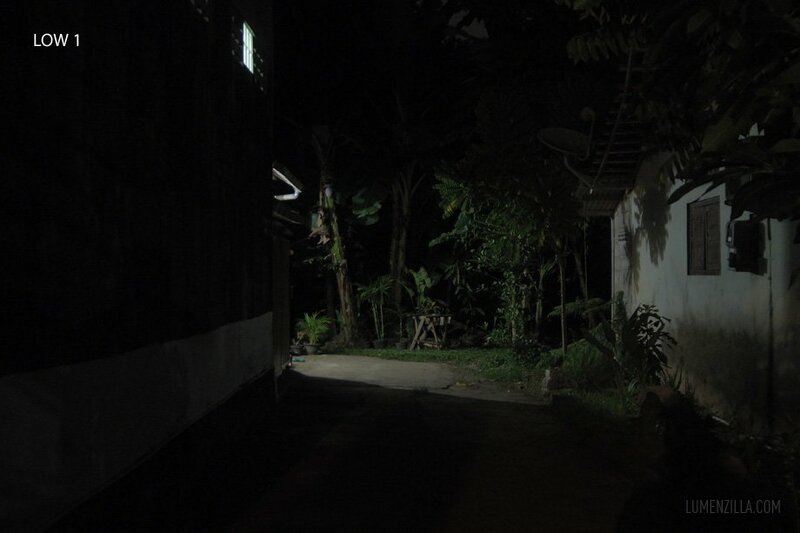 Now let’s take a look at the outdoor shot. 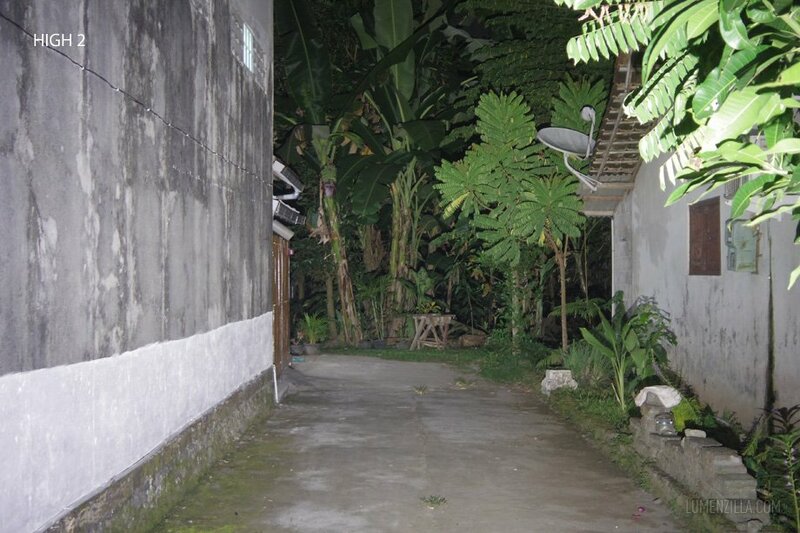 Distance between camera (and flashlight) to the banana tree is about 15 meters. 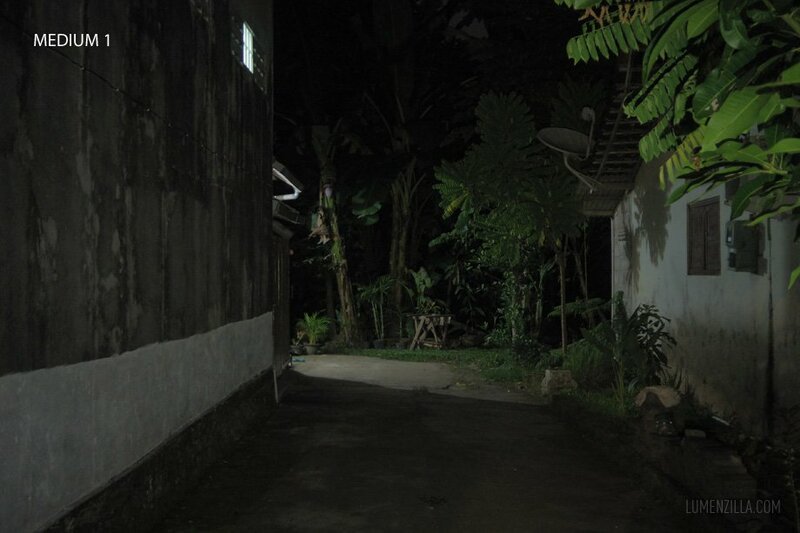 All pictures are taken with manual exposure: 0.6 sec, f/1.9, ISO 400. 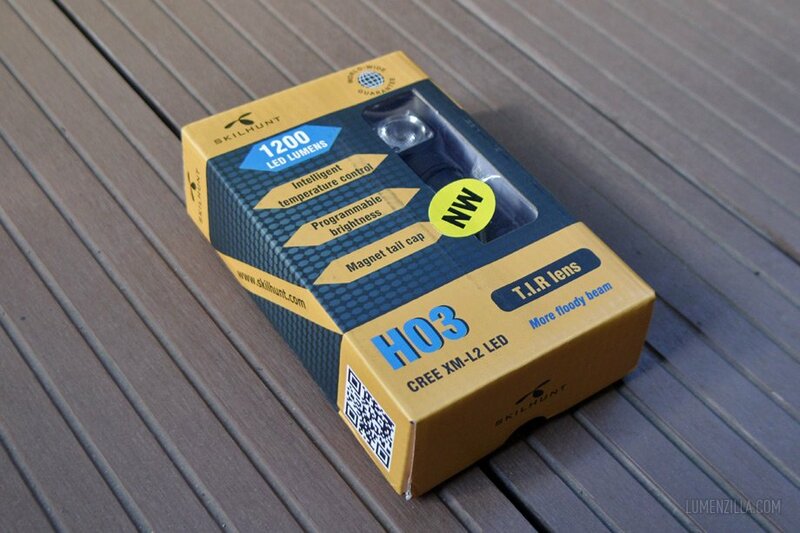 Skilhunt H03 is an impressive headlamp (1200 lumens) that can be used as flashlight. It has many modes but the access is easy. Shortcut to low, turbo, and disco is an advantage. Working voltage range is 2.7 – 8.4 volts so we can use 2 x 16340 batteries as well. Accept 1 x 18650, or 2 x CR123, or 2 x RCR123 (16340). Available in 3 models (TIR, reflector, or flippable diffuser) and available in both cool white or neutral one. Super flood light, illuminate wide area. Turned on by single click, turned off by long press. Not ideal interface IMO. 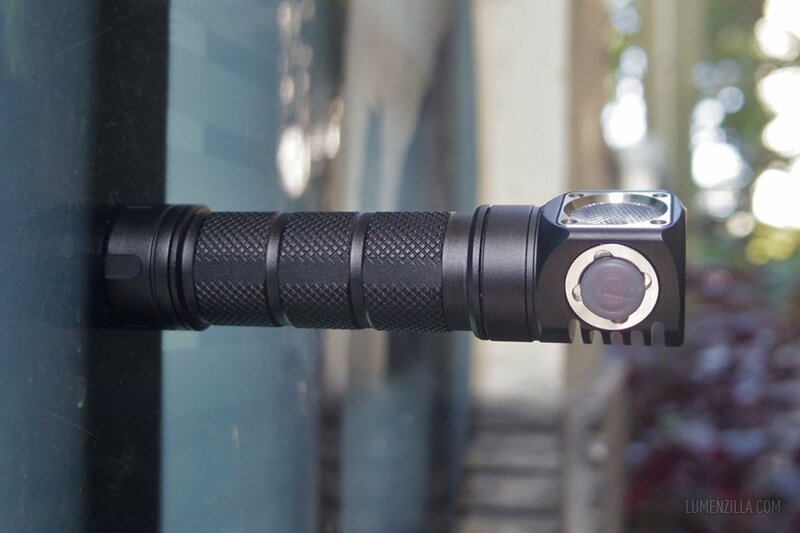 Get 37% OFF on your Skilhunt H03 purchase by entering code H03GB on checkout.